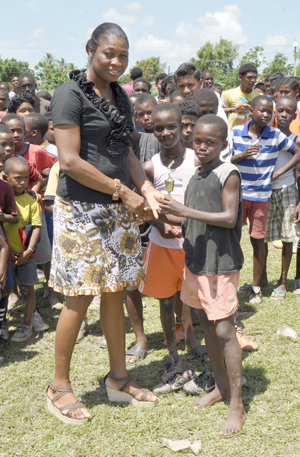 The one-week youth Academy organised by the East Bank Football Association (EBFA) and sponsored by the Ministry of Culture Youth and Sport (MCYS) ended on Friday last at the Grove Community Centre ground with participants involved in Under-13 and 15 small sided games. The participants which numbered 130 over the five-day course of the academy were placed into four groups, Argentina, Legend, Blood Diamond and Rising Star. Ms. Gillian Frank presents the winning Under-13 trophy to captain of Argentina, Devon Padmore. MCYS Director of Youth Ms. Gillian Frank (3rd right) poses with participants and coaches of the EBFA/MCYS Youth Academy following its conclusion. Emerging as winners of the U-13 competition was Argentina while the U-15 segment was taken by Blood Diamond. Director of Youth within the MCYS, Ms. Gillian Frank was present on the final day and interacted with the participants before officiating in the closing ceremony. Ms. Frank congratulated the enthusiastic participants and coaches for the discipline they would have displayed during the course of the programme, noting that she was kept up to speed with progress by the Coordinator, Wayne Francois. The participants were encouraged to always aim high and to be disciplined in whatever they do whilst ensuring that they also place a high premium on their education. Players and non players drawn from Agricola to Kuru Kururu on the Linden Soesdyke Highway participated in the academy and were presented with certificates of participation at the closing ceremony.